Hoping to find some myWorld miniatures at the local Walmart (I didn't), I took the Antes along for size comparison. We went our favourite froyo shop after dinner and the ladies attempted to guilt me into a taste. 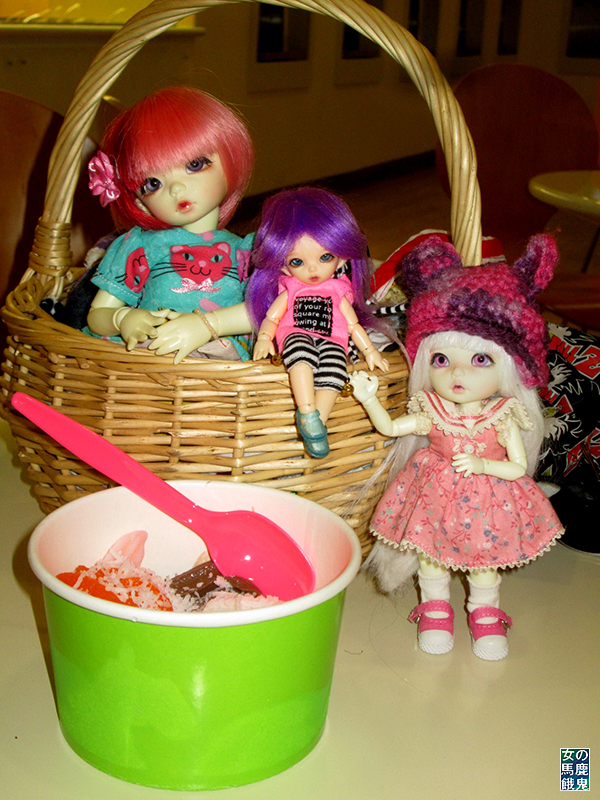 From left to right: Garnet, Niabell and LilliPilli. Honestly, when they released the MNF in the fullset I was repulsed by the dark eyebrows with the white wig. It looked terrible. I will consider a MNF Ante if/when they make an Elf version. I held out for a MNF Shiwoo and they finally made one so I perhaps in a few years they will offer Elf MNF Ante. I really wanted a LTF Ante when the regular Ante was first released but got Garnet anyway. I may get one on the MP one of these days, because one cannot have too many small Antes. Both Niabell and LilliPilli were MP purchases. I have ALL of the Shiwoo sizes now! I guess it is time to pester FL for a PukiPuki Shiwoo.